323 — the Main Street restaurant opposite Coffee An’ — closed suddenly today. Employees arriving for work were given no notice. Neither were musicians who had been booked for upcoming gigs. 323 was known for live music. Last month, Aztec Two-Step played there. Last summer, 323 made headlines when the bar featured a drink called the Tuskegee Experiment. There was no connection at all between the cocktail, and the shameful 40-year period in American history when US Public Health officials tracked the progression of untreated syphilis in black men. 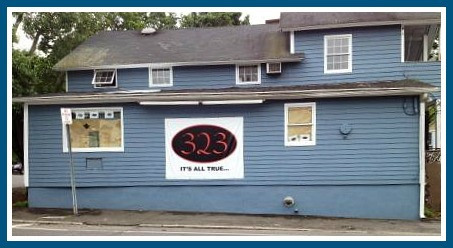 In 2013, this sign said that 323 restaurant was coming soon. Five years later, it closed. This entry was posted in Restaurants and tagged 323 restaurant. Bookmark the permalink. I don’t know how they stayed open as long as they did. I think it’s a good location for a local hangout, not so much for an upscale place. I actually ate there while visiting the Raffels; it was good. And it was so many restaurants over the years… Boogies, a fish restaurant and a French one, too among them. Bring back Bogies or something similar…..
ate there quite often years ago. stopped after having an unacceptable meal. spoke with the waiter who did nothing. also filled out a customer card and never heard back. why bother having me fill out a card if you don’t respond. hate to jinx it but I think harvest will be next. same issues exactly. I have to disagree with you about Harvest. I’ve eaten there several times, and have never had a bad meal, nor encountered unacceptable service. The staff has always been friendly and helpful. I agree with Bobbie. Our experiences at Harvest have been excellent, great food and attentive service. I’d be very disappointed if Harvest closed. Cathy, you must have hit it on a bad night (or afternoon). Give it another try. Nice place, terrible parking. Uneven food services. Good drinks. Great music. Partially killed by the sanctimonious…. Next Victim. Its easy to criticize. This is a drive to location competing with Saugatuck and Westport Center. Very nice people. Sorry to see them go. Really, Dan, 323 was know for Thursday Night Jazz, a series begun over 3 years ago by the Jazz Society of Fairfield County, featuring Greg Wall, the “Jazz Rabbi” and begun by my wife Ina and I. All other music was more recent except for the occasional local rock bands who performed there. Our series has moved to Pearl at Longshore, still on Thursday nights. I welcome you to come there and see how this has enriched the Westport evening entertainment landscape. I will happy to host you and pay for your meal! I apologize for any grammatical errors! Black Duck redux?…Probably not. “The Duck” was worthy…This joint, not so much. I don’t think Black Duck ever fessed up to whether their “closing” was a stunt or not? Sure seemed like it was, and if so, not cool. Could be a great location for a Box car cantina in Westport !? Went there when they first opened for dinner. Found it cold and uninviting, food was average or slightly below, and fairly expensive. It was trying too hard to be fancier than it was. Given this is slightly outside downtown, in a slightly more residential area, it would definitely be better as a casual place. Maybe something with a pool table and a warmer, cozier atmosphere. Not that sudden. I have a text exchange from a couple weeks ago. Is Sorry to see any Business Close .. I’ve had lunch there a few times and found it pretty Good … I know they put lots of $$$ into the building , that took 6-9 months to complete prior to opening the door .. I blame many Business Closures , due to the High Rents in Westport … I wish the owner & staff members the Best ..
Not too long ago, I ordered a pint of draft beer at 323. Cost: 9 dollars. Go figure. Quite frankly, I don;t think the owners were interested in running a restaurant… just a venue. Never saw much of them unless it was a night with live music, and they disappeared soon after the last set. NEVER there on any other night. I’m guessing it was more of a hobby than a true business venture. Several times over my last visits, they were closed… early and for no given reason. That is the death knell of ANY restaurant. Owners think they are saving a few bucks by closing when business is slow… which disappoints those who DO show up…so, once bitten, they don;t try going there again and business “mysteriously” gets thinner and thinner. A shame, as night life in Westport is pretty darn thin. .. even for a nightcap or two. IF I were a proprietor in Westport, I’d ramp it up a notch and cash in on the paucity of choices. My wife and I went to this place all the time. It had a lively bar scene, which we liked, but mainly we enjoyed Thursday nights when the Jazz Rabbi played. He was there sometimes with his own small group and sometimes with the other top-notch musicians, some quite famous, who gravitated around him. I’m not even that much of a jazz fan myself, but I know great music when I hear it, and it was fantastic having world-class performers like these in an intimate setting right down the street. The Rabbi left 323 two weeks after the incomprehensible “Tuskegee Experiment” episode, and I’m sure the temporal proximity was no accident. I’m furious at the owner for having allowed such stupidity to undermine both his own business and what was becoming a local institution. However, nothing throws the Rabbi off his game for long, and as Dr. Epstein pointed out above, he and his rolling cast have already re-grouped at Pearl at Longshore. As far as I can tell, the Rabbi’s doing fine there, and my wife and I still go, but Pearl is a larger, more formal venue and just not the same. To my ears, good music becomes magical when you’re close enough to feel, or imagine you feel, the body heat of the performers. The mediocre food and slow service at 323 on boozy jazz nights had become part of the atmosphere. Nobody minded. The over-worked staff was always friendly no matter what. Westport is badly in need of more live-music venues. The success of 323’s music program, temporary though it became, proves there’s a demand in Westport for this sort of thing. The 323 Main building does have a serious flooding issue whenever the monsoons come to town, but I’m hoping that there’s somebody out there with enough vision and entrepreneurial energy to tackle the problem and revive the spot. It has plenty of good karma remaining even after the Tuskegee fiasco.